Hope Valley lies in the heart of the Derbyshire countryside capturing the very essence of this picturesque and ancient landscape. The wide naturally formed valley stretches from Mam Tor in Castleton to the historic town of Hathersage taking in some of the Peak Districts most famous and historical sites such as Peveril Castle, Peak Cavern and the iron age hill fort of Carl Wark. The valley is now a major tourist destination and a haven for those who love tranquillity, beauty and nature as well as those looking for a sporting adrenalin rush, so there is something for everyone from exploring to walking, cycling, pony trekking, rock climbing, potholing, hang gliding off Mam Tor as well as the quieter activities of artists, anglers and birdwatchers. At the head of the valley an Iron Age fort can still be seen on top of Mam Tor also known as the Shivering Mountain. Below the mountain is the spectacular Winnats Pass the only road in from the west now that the road down the shivering face of Mam Tor has been swept away by repeated landslips. The road drops down into Castleton which is a centre for visiting the old lead mine workings where the attractive Blue John stone was found. Halfway up the cliff above Castleton is Peveril Castle a prominent Norman keep built in 1088. In the centre of the valley at Hope there is the long established Hope Cement Factory, the biggest in the UK. There are traces of a Roman fort at Brough, which replaced its Roman name of Navio, and ancient relics from the site can be seen in Buxton Museum. At the eastern end of the valley is Higger Tor which at 434 metres (1424 feet) is a dominant landmark of the Dark Peak area of the Peak District National Park. It stands 1.2 miles to the west of Hathersage and overlooks the Burbage Valley and the Iron Age hill fort of Carl Wark. A scene from the 1987 film ‘The Princess Bride’ was filmed nearby at Carl Wark with Higger Tor visible in the background. Its summit is a mixture of stones and boulders and provides wonderful views of the Hope and Derwent valleys. 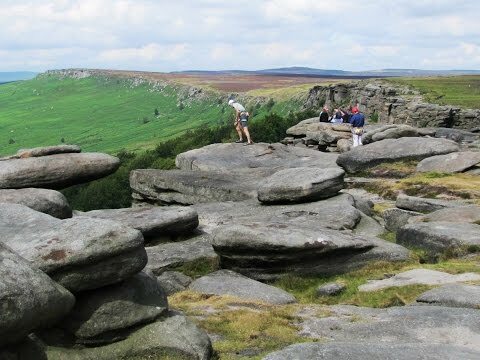 Hathersage is a village popular for walkers and rock climbers due to the moorland and a line of grit stone edges that sit on the east side of the village of which Stanage Edge is the largest. There are also spectacular tors, such as Higger Tor, and the hillfort at Carl Wark. Several of the edges were quarried and the area was a major source of millstones for grinding corn and metals. Until the late 18th century Hathersage was a small agricultural village with cottage industries making brass buttons and wire. By the early 19th century there were several such mills in operation which lead to the manufacture of needles and pins, for which Hathersage became famous. A paper mill was also in operation near North Lees making wrapping paper for the production of the needles and pins. At the end of the 19th century wire and needle making moved to Sheffield and the last mill closed in 1902 but some of the mills are still standing. Hathersage has historical associations to Robin Hood and the Eyre family. Charlotte Bronte visited the village in 1845 and used it as the ‘Norton’ of the story ‘Jane Eyre’ taking the heroine’s surname from the local family. North Lees Hall, an Elizabethan manor house 2km north of Hathersage is believed to be the inspiration for Thornfield Hall Mr Rochester’s home in Jane Eyre and where Mrs Rochester jumped from the roof to her death. The Church of St Michael and All Angels in Hathersage dates back to the 14th century but its tall tower and spire are a hundred years younger. The stained glass east window comes from the Church of Derwent before it was submerged beneath the rising waters of Ladybower Reservoir. In the churchyard there is a long grave said to be that of Little John, Robin Hood’s henchman. The old centre of Hathersage was just above the church to the north but now the modern centre below the church offers a range of pubs, hotels, shops and banks, a cafe, a Youth Hostel and an outdoor swimming pool which is only open in the summer. There is also a Railway Station, on the Manchester-Sheffield line, on the southern edge of the village. Upper Burbage Bridge offers wonderful sunsets and views of the Burbage Valley, Higger Tor and Carl Wark. The dramatic rocky landscape covered in purple heather in late summer and autumn will take your breath away. The free car park here has recently been constructed with stone and reinforced with grass. Stanage Edge, a grit stone escarpment, situated on the moors north of Hathersage is the largest and most impressive of the grit stone edges and also provides wonderful views. It stretches for approximately 3.5 miles from its northern tip at Stanage End to the southern tip near the Cowper Stone and can be seen for miles down the Hope Valley. Areas of Stanage were quarried in the past to produce grindstones and some can still be seen carved on the hillside. These abandoned relics of an industry that supplied the steelworks of Sheffield and local corn mills declined by the 1860’s due to the coming of the roller mills and French imports which were both cheaper and better. A paved packhorse road ran along the top of the edge and about half way along the edge it is crossed by Long Causeway, an old Roman road, from Navio (Brough) to Doncaster both of which remains can be seen. The highest point is High Neb at 458m (1503ft) near the northern end of the main edge. Stanage Edge being made of one of the finer gritstones makes it ideal for rock climbing and climbers over the years have given names to sections of the edge such as Marble Wall, Black Hawk, Goliath’s Groove, The Tower, Robin Hood’s Cave and many more. The edge was once a private grouse moor to which access was forbidden and early rock climbers were forced to make secret visits or bribe the gamekeepers with barrels of beer. After the Second World War access got easier making it more accessible. Stanage Edge became a magnet for climbers, walkers and runners. Although the edge reaches only 25 metres in height it is one of the most famous UK climbing places. The Stanage Struggle is a local fell race that starts in Hathersage and rises up to High Neb before returning to the village. Stanage is now suffering from its popularity it was once clad in heather and bracken with heather in many of the cracks. It is now being worn away with erosion occurring around it and many of the popular climbs are becoming very polished through the ascents of many climbers. The Sheffield Country Walk is a 53 mile (85km) long distance footpath around the outskirts of Sheffield. The route follows woodland and riverside paths as it rises and falls over farmland and the open gritstone moorlands to the west of the city. The route also passes many sites and buildings of archaeological, historical and industrial interest. We park in The Dale and head back towards the town for a short way and turn right into Church Bank. We head uphill and turn left into the churchyard to look for the grave of Little John. We keep bearing right through the churchyard to the church car park (church use only). We arrive back at Church Bank and head straight forwards through the little gate and follow the narrow path into the trees. At the post with the yellow arrows we bear right for a short way to go through a gate to a tarmac track. We turn left heading uphill along the tarmac track and turn right at the yellow marker just before the cattle grid. We head forwards going through a gate at the top of the field and turn right onto a track. We soon start heading downhill to meet the road where we turn left. We follow the road, ignoring a footpath on the right, until we come to a left hand bend. We head forward on the wide track and after passing a derelict building we go through a gate and keep heading forward past an open access gate on the left. We go through a gate and head forwards uphill and turn right at a little path towards the road and a car parking area. We cross straight over and follow the path opposite to the top of Higger Tor. We then bear left following the distinct track to Upper Burbage Bridge. At the road we turn left past a car park then at the bend in the road we head straight forwards on the path up to the top of Cowper Stone and the trig point. We now keep following Stanage Edge for about 1.5 miles then take the track bearing off to the left downhill. The track bears left round the back of some trees to a small road, a wood and a car park. We turn left along the road with the wood on our right. At the cattle grid we turn right through the gate with the wood on our right. We follow the track to a farm go through the gate and turn immediate right through the wall signposted Hathersage. We make our way across the fields into some trees. We cross over a footbridge and turn right following the stream and the trees on our right to the road. At the road we cross straight over and keep heading forward to the left of the buildings of Brookfield Manor. We make our way through the fields following the markers. At the second gate we go through the little gate on the right and turn immediate left uphill following the hedge line on our left to another little gate with a yellow arrow. We go through the gate and head forwards through the long field towards the church we can see in the distance. At the church we make our way back to our parked car. This is a moderate walk on good paths and tracks through fields and along Stanage Edge. There are some inclines and declines and also three short sections of road. Elevation: approx lowest point 169.3m (555.4ft) approx highest point 451.6m (1481.6ft) approx total ascent 438m (1437ft). Approx 7.4 miles allow 3½ – 4 hours using OS Explorer Map OL1, The Peak District Dark Peak area. Start point: The church at Hathersage. This walk is anti-clockwise. Hathersage is in the Hope Valley in the Dark area of the Peak District. From the M1 take junction 36 at the roundabout take the 2nd exit onto the A61. At the main t-junction turn left still on the A61. On the dual carriage way turn right at the 2nd roundabout onto the A6101 at the end turn right onto the A57 towards Glossop and then turn left at Ladybower Reservoir onto the A6013. After passing through Bamford continue to the T-Junction. Turn left onto the A6187 for Hathersage. After going under the railway line continue on the main road and take a left turn onto School Lane. The road bends round to the right onto The Dale. Parking: Free roadside parking or there is the pay and display car park on Odd Fellows Road. There are public toilets on the main road through Hathersage. For refreshments there are a number of pubs, hotels, shops and a cafe.